Tidewater Community College theater students learn how to act and use their voices and body movements to project characters from the printed page to the stage. They study sound and lighting, as well as set design and creation. Looking at the big picture – they become part of a team that works in high gear to present three live productions a year. TCC Theatre holds fall and spring productions in the Chesapeake Academic Building and in the TCC Roper Performing Arts Center in downtown Norfolk. Outdoor summer theater is showcased on the grounds of the Chesapeake Campus. 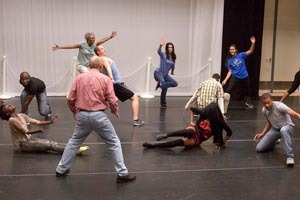 Students studying performance theater are often on their feet practicing skills. They study voice and diction, acting, stagecraft and theater appreciation. “We believe in learning by doing,” said Ed Jacob, acting professor and former program head. “The skills we focus on prepare students to take the stage here and elsewhere. Technical theater students spend 10 percent of their time in classroom and 90 percent in the workshop, building sets and learning technical aspects. Students learn stage lighting and sound, stagecraft or set creation and how to set the pace for a show. The Career Studies Certificate in Theatre Arts gives students the chance to customize their education, learning about both the performance and technical sides of theater. TCC Theatre brings more than 3,000 people on campus annually to experience a live production. “Chesapeake doesn’t have a local theater company, and the college has provided the community with this valuable resource for many years,” Jacob said. TCC Theatre’s fall show, “An Evening of the Arts,” will run Nov. 12-15 with performances at 8 p.m. in the Black Box Theatre in the Chesapeake Academic Building. TCC Planetarium: Lights, camera, wow!